My 3 year old has discovered ballet and just like I was at her age she is in love. I took ballet for close to a decade and like many women who went through it have very mixed feelings about introducing it to my own daughter. What I am not apprehensive about is reading books about ballet with her. These books let her explore ballet before ever stepping foot into a studio. Do you have a child who loves ballet? 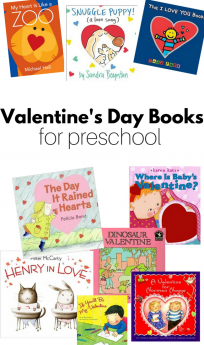 Do they have a favorite picture book that I didn’t include? Share the title in comments and we can keep this list growing. Dancing in the Wings by Debbie Allen is about more than ballet, it’s about overcoming being different, accepting your body and even standing up for yourself. Sassy is tall, too tall to partner with any of the boys in her ballet studio and sticks out like a sore thumb. When a chance to audition for a summer ballet program in Washington D.C. arises other dancers in her studio make her doubt her talent. So often adults are able to see how awkward and different children are really striking and unique but getting the child to see that can be impossible. This book is all about a child discovering that different isn’t bad and that those differences are all she needs to stand out in a great way. It was a little long for my daughter who is 3 but she sat the whole time enjoying it all the same. 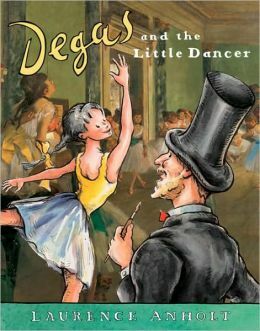 Degas and the Little Dancer by Laurence Anholt is the story behind Edgar Degas’s Little Dancer sculpture. This book resonated with me because I already know and love the sculpture. While living in St.Louis I would often walk to the art museum and visit her. The book would be perfect to pair with a lesson about the art work, after a visit to see it ( there are many bronze copies of the original wax sculpture around the globe) or for other children who can make the connection but my kids were not nearly as engaged with the book as they could have been with more personal history. I loved it though. Ballerino Nate by Kimberly Brubaker Bradley is on my must buy list. I don”™t say that often, especially with such a great public library, but this book is wonderful. Nate is a little boy who after seeing a ballet school production with his class at school, decides he too wants to take ballet. Of course his older brother has something to say, and say and say but Nate is pretty confident with the help of his parents , that boys can take ballet. I love that Nate wants to dance but he hates the idea that he might have to wear pink, clearly pink is not a good thing to him, he just wants to dance. What I love about this book as a woman who spent more than her fair share of time in ballet , is that it depicts boy dancers well. The stereotype of a “sissy” doesn”™t often fit and I knew many boys that danced that were masculine and graceful. I encourage parents of boys and girls to read this, to open our kids horizons to being interested in whatever their heart desires, not to what older brothers, neighbors or anyone else tells them to be. 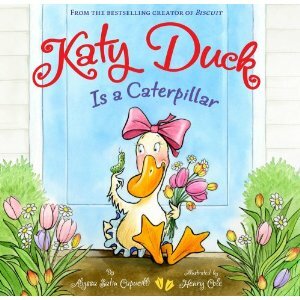 Katy Duck Is a Caterpillar by Alyssa Satin Capucilli is a story about things not working out the way you expect , but finding out they are even better! Katy Duck loves to dance, and she loves the spring! When her dance school puts together a spring recital she is disappointed as each part she imagined she”™d have is given to another student. Katy is given the part of the Caterpillar. She is horrified, caterpillars squirm , they don”™t dance. Of course caterpillars turn into butterflies and this one is no exception, Katy shines even if she has to crawl first. 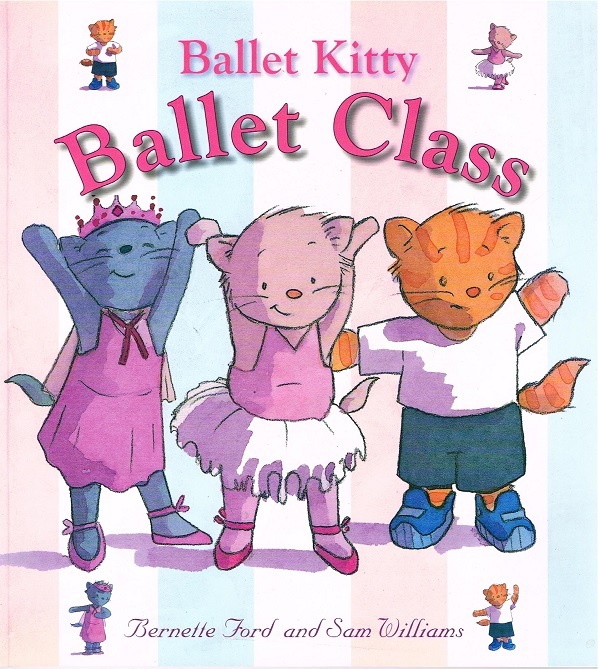 Ballet Kitty: Ballet Class by Bernadette Ford is one book in a series of cute ballet books for young children. My daughter loves this book and I do too. The story is about three kittens that are off to ballet class and Ginger Tom the only boy is not excited about the class. The two girl kittens tease him a little for being in his sneakers instead of the ballet slippers he is refusing to wear but in the end everyone has fun at ballet and are excited about going back together next week. I like it because it addresses the fact that most young kids see ballet as an activity for girls but simply says it’s for boys too. Indescribably Arabella by Jane Gilbert is an interesting story about embracing our talents, and being who we are not some cookie cutter idea of perfection. Arabella wants to be famous but she gets turned down and discouraged by her art teacher, her acting coach and her ballet teacher all because she is a little different. Her heart is there, her passion for the arts is there but she just won”™t make a famous artist, actress or ballerina. After a pep talk with an older couple she sees that she has something better than perfection, she is unique. 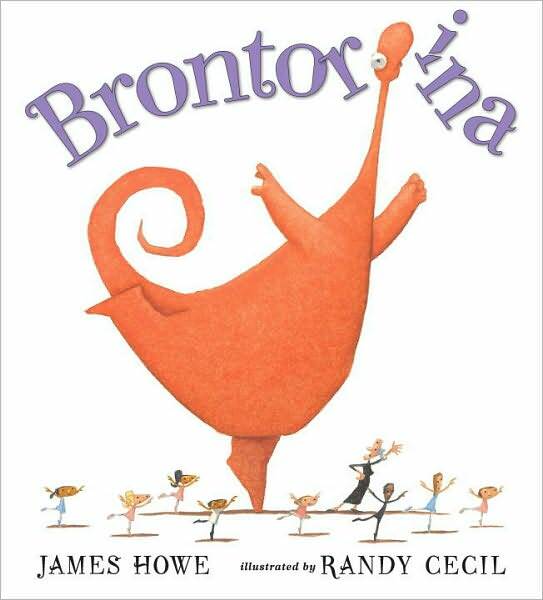 Brontorina by James Howe is possibly one of my new favorite books on the planet. It’s not a new book but I have never read it before. My daughter loved it and while the lesson about creating inclusive environments went over her head the lesson about being true to yourself and doing something that has never been done before didn’t. The story is about a dinosaur who wants to be a ballerina and while a studio initially allows her to dance it’s clear that she is just too big. The story doesn’t end there and with some help from friends who support her dream they find a way to include everyone. 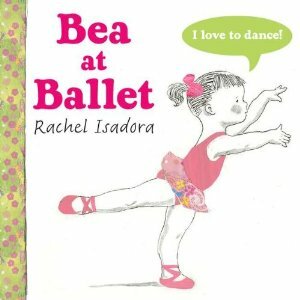 Bea at Ballet by Rachel Isadora is another gem. This book explains what happens at a ballet class for the very littlest dancers. I love the variety of little dancers in this book, their little toddler bellies and all the little details. My daughter so badly wants to take ballet and this book was great to help answer her questions about what happens in a ballet class for someone her age. A great book for 2-4 year olds. Lili on Stage by Rachel Isadora. 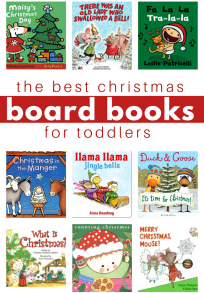 This book would be the perfect gift for a child going to see the Nutcracker at Christmas. This book takes readers through what being in a professional production of The Nutcracker is like for a young child and it’s spot on. My sister was in a professional production of The Nutcracker two years in a row and even though it was over 25 years ago this book jogged so many memories of what she did before during and after the production. This book was way over my daughter’s head but children 4 and older who are into ballet would absolutely love it. Not Just Tutus by Rachel Isadora was disappointing. This book has a long rhyming text that put me kinda on edge. 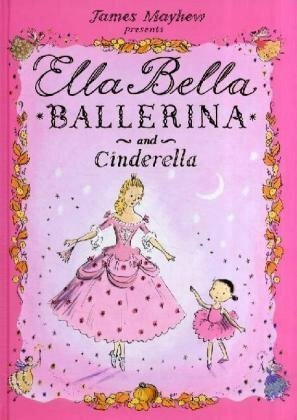 I think the author was trying to give a realistic view of ballet but talking about the bunions, the blisters ,and describing a dancer who is thin, tall and pretty as having it all stopped me from sharing it with my daughter. I am very cautious about what I say and do with my daughter as far as body image goes and very much on the fence about introducing ballet to her because of body image issues I have as a result of my ballet experience. So all that baggage coupled with the text came together to leave a bad taste in my mouth. Maybe without that baggage you wouldn’t even see the text as negatively as I did but I can’t say I like a book I didn’t. 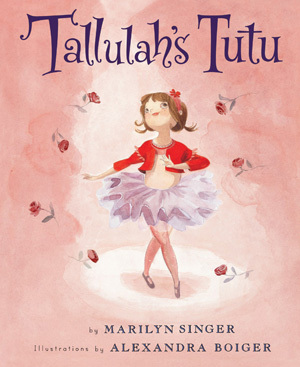 Tallulah’s Tutu by Marilyn Singer is one of many Tallulah ballet books. I love these books and my daughter will grab them and sit through about 3/4 , they are just too long for her right now. This is the first book in this series and I can recommend every one. The story is about Tallulah who is eager to be a ballerina, mostly because she really wants to wear a tutu. Who can blame her? Tutus are rad. She heads off to ballet class and is sure that the tutu is on it’s way. For whatever reason she thinks that a tutu is given to dancers for a great performance in class like a medal. She tries so hard but when the tutu never arrives she decides that ballet isn’t worth her time. I love this book because of all the things ballet gave me as a child it’s lasting gift has been discipline. In a round about way Tallulah learns that ballet isn’t about the sparkles and tulle and instead is about effort and achievement. Great lesson for us all. Ballerina! by Peter Sis is a simple and wonderful book about a little dancer’s fanciful visions of herself as a wonderful ballerina in various costumes. 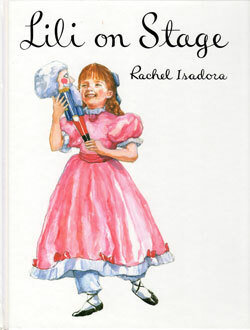 The costumes all come from famous ballets but young readers will just see a dancer playing dress up. My daughter loved the book and it’s simple illustrations. 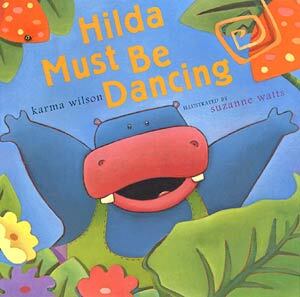 Hilda Must Be Dancing by Karma Wilson is a lovely story about a big hippo that loves to dance, although her neighbors aren”™t as keen. See Hilda is bog and when she dances she shakes and rattles everything, it”™s noisy and disruptive and is making her friends very angry. They suggest that she try new hobbies, but knitting and singing won”™t do it”™s simply not in her heart, Hilda needs to move and groove! I loves that a solution is found that makes everyone happy, that Hilda doesn”™t have to give up her passion, but that she isn”™t so selfish as to simply say ” too bad” to her friends either. Great list! Brontorina is one of our favorites, too. I’m excited to check out a few of these that are new to us. Check out Little Ballet Star by Adele Geras. We borrowed it from the library so many times I finally bought for my daughter’s birthday. It’s a favorite at our house. My five year old and I love The Very Fairy Princess Takes the Stage, and Fancy Nancy and the Mermaid Ballet. I especially enjoy the Fancy Nancy one – beautiful illustrations, and great message about friendship, emotions, and doing your best. Check out “Dogs Don’t Do Ballet” by Anna Kemp. It combines dancing and a dog – two of my toddler’s favorite things. The dog in the story loves to dance and follows his owner to the ballet studio, but is always told he can’t be a dancer. He proves them all wrong. Cute story, good illustrations, and just long enough to keep a kid’s attention. 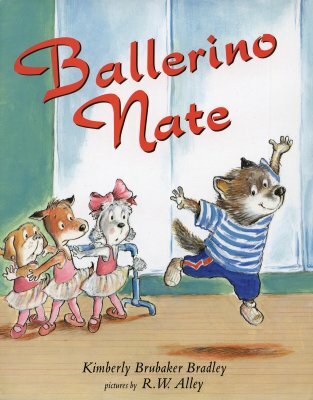 I remember reading Ballerino Nate to my kids! They loved that book. They also loved NOEL THE FIRST and NUTCRACKER NOEL by Kate McMullan. I think they are out of print but may be available from the library. My almost 3 year old loves Dogs Don’t Do Ballet, we get it from the library about once a month!And she learned the moves like pliÃ© and jete from the book. What a great list! 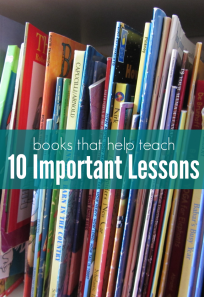 We’ve read quite a few of these and will have to check out the rest. In addition to the Tallulah books you mentioned, my 3 and 5 year old girls really like the “Miss Lina’s Ballerinas” series by Grace Maccarone. The first is about a new girl joining the class, the second is about a boy dancer, and the third is about doing your best with the part you are given. 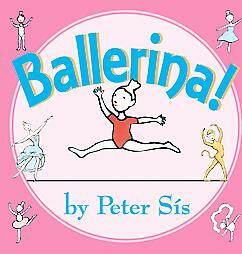 We’ve also read “Belinda, the Ballerina” by Amy Young, which is about a girl with huge feet who wants to be a dancer. 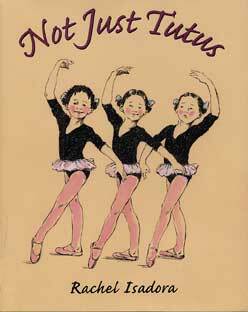 It’s not a typical ballet book, but I liked the message of being true to yourself and not worrying about your body. My girls, on the other hand, were just entertained by her big feet. Hi. This is a great list that includes some of our favorites as well, plus a few I haven’t heard of. I definitely want to read BALLERINO NATE after reading this post! 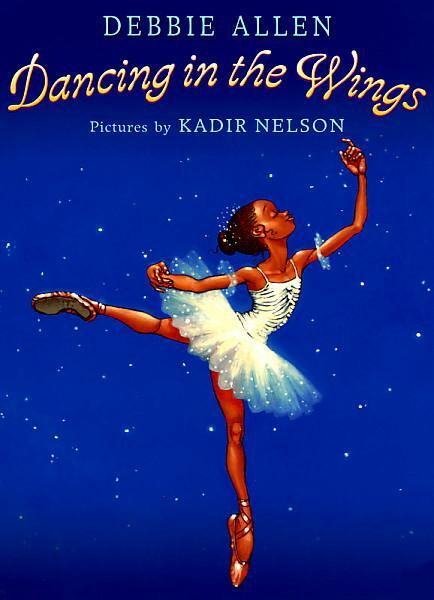 I actually have a blog devoted to the integration of dance and children’s literature, and it includes reviews on some of these books and others as well: http://www.kerryaradhya.blogspot.com. 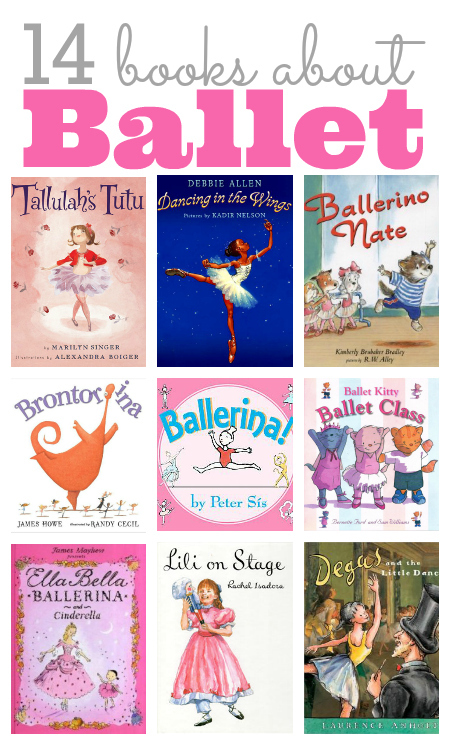 Happy reading with your ballerina-loving daughter! I had to add two of my favorites from when I was little. The first, All Tutus Should Be Pink, and the second Best Friends Wear Pink Tutus. I saw this post on Pinterest and I had to put my two cents in. THE ONLY BOY IN BALLET CLASS, By Denise Gruska, about a boy who loves ballet. You’re very welcome, but have you read these two books? Not yet – they are on my must read list. Have you read them? What are your thoughts? Yes I have. And when I read BASEBALL BALLERINA it made me angry when the mother forced the title character to take ballet. “My mom thinks baseball is for boys.” she says. I know a ballet teacher who has a collection of kids ballet books at her studio for kids to read. I gave her a copy of BASEBALL BALLERINA for her collection, but after reading it she rejected it, mainly for these two reasons-The ballet teacher in the book is mean, and would frighten kids from taking ballet because they might think ALL ballet teachers are mean-and, she’s TOTALLY against kids being forced to take ballet. I agree with her. Plus, it seemed to me the mother is forcing her little girl to do something she wouldn’t be forcing a little boy to do. THE ONLY BOY IN BALLET CLASS is about Tucker, a boy who loves ballet. But of course, he gets insulted because, “Ballet is for girls!” But he has the last laugh at the end! When I submitted this book to the ballet teacher she loved it! In fact, she has a boy student who already had the book! Thanks Ken for the review! Beautiful list…but where is Angelina Ballerina???!!! A Classic!!!!!! Often I choose books others don’t already know so sometimes the obvious titles are skipped.